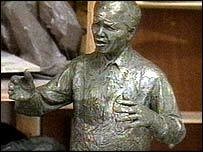 Nelson Mandela's statue will be placed in Parliament Square, ending a five year row over its location. London's mayor welcomed Westminster Council's decision to allow the statue of the former South African president in front the House of Commons. In 2005, the council blocked the mayor's bid to install the 9ft (2.7m) bronze sculpture in Trafalgar Square. The £400,000 statue by the late Ian Walters will be in the central garden of the square. Previous suggested sites included the North Terrace of Trafalgar Square and outside South Africa House. A date for the unveiling has yet to be agreed. Sir Simon Milton, leader of Westminster City Council, said: "From the start it was my belief Parliament Square was a more suitable location for a commemorative statue than Trafalgar Square." The mayor and supporters of the Mandela statue project, including Lord Attenborough, have campaigned for several years for a suitable location for the statue. The council objected to the Trafalgar Square option saying it would cause problems for the hosting of special events there. The council was backed by English Heritage and the National Gallery and Deputy Prime Minister John Prescott. London mayor Ken Livingstone said: "This is a huge achievement after years of campaigning. "London is proud to host this statue of Nelson Mandela, whose role in world history is finally being given the recognition it deserves," said the mayor. Wendy Woods, patron of the Mandela Statue Fund, said: "Parliament Square is a fitting place to acknowledge Mandela's statesmanship and international stature." Other statues in the square include Winston Churchill, Lloyd George, Abraham Lincoln, Benjamin Disraeli and George Canning.